A legend in the making. The true story of Errol Flynn. In 1930, before Errol Flynn (Thomas Cocquerel) became one of the biggest movie stars in Hollywood, a young Errol, braving cannibals and crocodiles, searched the jungles of Papua New Guinea for his Eldorado. While serving as a guide for a Hollywood producer, Errol discovers a map on a dead prospector that he believes will lead to a fortune in gold. Back on the streets of Depression-era Sydney, Flynn rounds up a ragtag crew to help him find the gold, including Rex (Corey Large), a Canadian ex-bootlegger, Dook (William Moseley), an English gentleman handy with a pistol and Charlie (Clive Standen), a grizzled old salt. After stealing the Sirocco, a yacht belonging to Chinese Opium smugglers, Flynn and crew set sail.They quickly learn just how perilous a voyage up the Australian east coast can be, running afoul of drunken cowboys, corrupt cops and local thugs before being intercepted by the Chinese smugglers, who are hell-bent on retrieving their Sirocco and the several pounds of opium stashed in the hold. As the motley crew make a final dash for New Guinea, Flynn is forced to learn what it means to be a real captain and master of his own destiny. 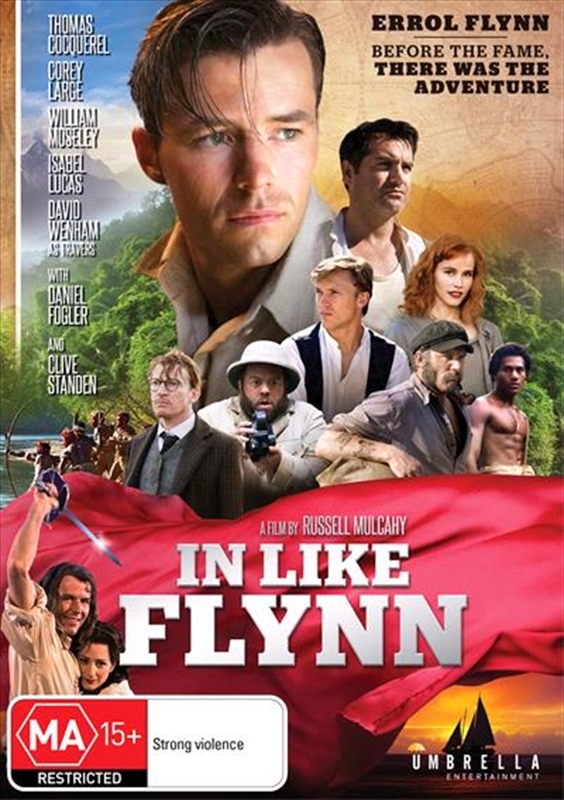 In Like Flynn is based on the real-life coming-of-age story about four men on a journey to find hope, adventure and fortune in a time when the world was spiraling into despair.